Details of President Trump’s first budget have now been released. Much can and will be said about the dire social consequences about what is in it and the ludicrously optimistic economic assumptions it embodies. My observation is that there appears to be a logical error of the kind that would justify failing a student in an introductory economics course. Apparently, the budget forecasts that US growth will rise to 3.0 percent because of the Administration’s policies—largely its tax cuts and perhaps also its regulatory policies. Fair enough if you believe in tooth-fairies and ludicrous supply-side economics. The Trump team prides itself on its business background. This error is akin to buying a company assuming that you can make investments that will raise profits, but then, in calculating the increased profits, counting the higher revenues while failing to account for the fact that the investments would actually cost some money to make. The revenue generated by the investments might exceed their cost (though the same is almost never true of tax cuts), but that doesn’t change the fact that the investment has a cost that must be included in the accounting. This is a mistake no serious business person would make. It appears to be the most egregious accounting error in a Presidential budget in the nearly 40 years I have been tracking them. Who knew what when? I have no doubt that there are civil servants in OMB, Treasury and CEA who do know better than this mistake. Were they cowed, ignored or shut out? How could the Secretary of Treasury, Director of OMB and Director of the NEC allow such an elementary error? I hope the press will ferret all this out. The President’s personal failings are now not just center stage but whole stage. They should not blind us to the manifest failures of his economic team. Whether it is Secretary Mnuchin’s absurd claims about tax cuts not favoring the rich, Secretary Ross’s claim that the small squib of a deal negotiated last week with China was the greatest trade result with China in history, NEC Director Cohn’s ludicrous estimate of the costs of Dodd Frank, or today’s budget, the Trump administration has not yet made a significant economic pronouncement that meets a minimal standard of competence and honesty. Several weeks ago I gave a talk based on my Brookings paper with Natasha Sarin at the Atlanta Fed’s annual research conference. Here are the video and slides. I continue to be puzzled by gap between what is widely believed and my reading of market evidence. I began by highlighting three facts that seem to me to be in substantial tension with the widespread view that banks are far safer now than they used to be because they are far better capitalized. Mark Carney’s statement that “The capital requirements of our largest banks are now ten times higher than before the crisis. . . . This substantial capital and huge liquidity give banks the flexibility they need to continue to lend…even during challenging times” is typical. First, there is distressingly little evidence in favor of the proposition that banks that are measured as better capitalized by their regulators are less likely to fail than other banks. Andrew Haldane suggests the absence of a relationship looking across banks before the 2008 crisis. Òscar Jordà and coauthors suggest the absence of such a relationship historically, using data for many countries. Jeremy Bulow and Paul Klemperer note that for banks whose crisis failure resulted in FDIC losses, the FDIC typically had to inject an amount in excess of 15 percent of their assets, suggesting that they in fact had substantial negative capital positions. Second, financial logic embodied in the celebrated Modigliani Miller theorem and suggested by common sense holds that substantial reductions in leverage, if achieved, should be associated with reduced volatility, reduced sensitivity to shocks and lower risk premiums. Our paper examines a comprehensive suite of volatility measures including actual volatility, volatility implied by option pricing, beta, credit default spreads, preferred stock yields and earnings price ratios. While each indicator has associated ambiguities, it is striking that none suggest a major reduction in leverage for the largest US financial institutions, large global institutions or midsize domestic institutions. Third, the ratio of the market value of bank’s common equity to its risk weighted assets provides a market based measure of its leverage. Of course, the market value of equity overstates true capital because of limited liability: if assets rise in value there is no limit to how much shareholders can ultimately receive; but there is a zero lower bound on what shareholders receive. Still, as Haldane and others have documented, this market measure has historically proven useful in predicting bank distress. The data suggest that on a market value of equity basis, major financial institutions are no less levered than they were over the period before the crisis—even excluding the couple of years before the crisis when there was plausibly a bubble element in market pricing. I am more confident that these observations need to be reckoned with in thinking about financial stability than I am in any particular set of explanations much less policy conclusions. Here though are some observations suggested by our findings. First, it is essential to take a dynamic view of capital. The health of a financial institution depends critically on the profits it can expect to generate in the future. I suspect that the decline in the ratio of the market value of bank equity to assets reflects declines in expected future profits, and that this declining franchise value, other things equal, causes banks to be more levered. The stress tests introduced by the regulatory community represent a welcome recognition of the need to take a dynamic view of capital. However I am inclined to agree with Jeremy Bulow who noted in commenting on the our paper that recent stress tests estimate that if GDP drops 6.25 percent, unemployment doubles, the stock market halves, and real estate falls by 25 to 30 percent, then capital losses would be insufficient to trigger “prompt corrective action.” Bulow wonders—and we do as well—if this is not more of a comment on the inadequacies of the stress test procedures, than on the soundness of the banks. Second, a crucial challenge for financial regulation going forward is assuring prompt responses to deteriorating conditions that do not set off vicious cycles. Markets were sending clear signals of major problems in the financial sector well in advance of the events of the fall of 2008 but the regulatory community did not even limit bank dividend payouts, even after the experience at Bear Stearns, which had been deemed very well capitalized even as it was failing. Current experiences in Europe where some institutions have a price-to-book ratio of barely 0.35 and have not yet been forced to raise capital are not encouraging about lessons learned. Third, regulators need to be attentive to franchise value. It goes without saying that banks should not be permitted to take excessive risks or treat customers unfairly in order to raise their franchise value. Nor would it be wise public policy to undermine competition in banking in order to raise franchise values. On the other hand, it is not just an issue of cost, but financial stability as well when regulators impose needless burdens on banks. This point was brought home to me not long ago when I heard about the legal contortions one big bank felt it had to go through when I recommended a student for a job. Would hiring the student be doing me an impermissible favor? Would not hiring the student be unfair? The debates surrounding my well-intentioned suggestion consumed hours of time on behalf of the bank’s compliance team. And I am sure such abundance of caution is commonplace at most large financial institutions. On a random Tuesday, there are hundreds of federal government employees going to work at each of our major banks, some of which have more than 10,000 people engaged in compliance activity. Regulatory costs are an especially large issue for smaller banks since there are almost certainly economies of scale in compliance functions. There is also the crucial point that incomplete regulation which discriminates against banks in favor shadow banks may by undermine financial stability in two ways. First, shadow banks may become loci of instability. Second, weakening the franchise value of regulated institutions may make their insolvency more likely. Fourth, bankers may be more right in their concerns about increased costs of capital and its effect on lending than economists usually suggest. Economists like Anat Admati normally rely on Modigliani-Miller considerations to argue that enhanced regulation does not raise capital costs, because it makes equity safer. If as our results suggest equity is not safer, there is every reason to suppose that bank capital costs have increased as a consequence of regulation, and that this may to some extent have reduced credit flows. Fifth, it is high time we move beyond a sterile debate between more and less regulation. No one who is reasonable can doubt that inadequate regulation contributed to what happened in 2008 or suppose that market discipline is sufficient to contain excessive risk-taking in the financial industry. At the same time, not all regulatory expansions are desirable and in some contexts tougher regulation can be counterproductive for financial stability if it reduces profitability without offsetting benefit, if interferes with bank diversification, or if it causes regulators to become overly identified within regulated institutions. Neither the approach that holds that all increases in measured capital and other regulation are attractive, nor the one that holds that capital and other regulations should be completely scaled back is likely to prevent or contain the next financial crisis. Last week I suggested that I felt sorry for Treasury Secretary Steven Mnuchin. He found himself forced by circumstance and his president to say and do things that undermined his and Treasury’s credibility. I wish there was an external force that could be blamed for the secretary’s comments on Monday, but they look from the outside like unforced errors. At Michael Milken’s annual conference for investment professionals, he crowed to the bankers present that “you should all thank me for your bank stocks doing better.” I cannot conceive of any of the 11 other secretaries I have known making such a statement. Leave aside the question of whether whatever credit is to be claimed should be claimed on behalf of the president. Since when is the stock price of banks the objective or the standard of success for economic policy? And when, as will inevitably occur, bank stock prices decline, will the secretary accept the blame? The secretary also doubled down on his surprising statements of last week by predicting that within years the economy will be regularly growing at above 3 percent. This is not the view of mainstream forecasters, and in light of the very slow growth in the adult population, and reduced immigration along with low unemployment, it would require a productivity growth miracle. He cited no evidence in favor of his views. The secretary claimed that President Trump’s tax cuts will be the largest in history. Relative to any relevant denominator, like total tax collections or GDP, President Ronald Reagan’s were far larger. Usually treasury secretaries try to stay out of the president’s personal politics. Yet Mnuchin has made the claim that the president has given more financial disclosure than anybody else. This is ludicrous. Hundreds of officials from presidents on down have made their tax returns available to members of Congress as part of the confirmation process. And for 40 years all presidents have released their tax returns. President Trump has been not the most but the least transparent president in the last 50 years. There will likely come a time when the secretary of the treasury will need to invoke his credibility to support confidence in the economy, to stabilize markets, or to mitigate an international crisis. Let’s hope that when the moment comes Mnuchin will retain some credibility. This will require an end to days like yesterday. Fintech is ultimately about taking away frictions. I gave as examples of frictions that are kind of shocking in the 21st century the huge premiums people pay for title insurance every time they refinance a mortgage, the inability of major banks to enable even major private bank customers to automatically pay down their credit line whenever they have cash inflows, and the $40 billion-plus in credit and debit card interchange each year. I guessed that 10 years from now, the odds that there would be a fintech company with the kind of $250 billion market cap that some big American banks have was about 25 percent. I did not expect that in the foreseeable future fintech would have the kind of existential impact on banks that Netflix has had on Blockbuster. I do think in some areas fintech companies are likely to have the kind of impact that Skype has had on major telephone companies — forcing drastic reductions in pricing and profit margins on some key products. I surprised Markus a bit by being skeptical of the idea that one of the big technology players like Apple, Google, Facebook and Amazon would become big players in financial services. I noted the traditional American aversion to combinations of banking and commerce and also noted that I thought privacy rules would preclude their using their massive data troves to drive lending activity. I was quite serene about the impact of fintech on financial stability. In general it seems to me that prevailing understandings of financial crises put too much emphasis on financial innovation and too little on age-old rapid oscillation between greed and fear, on real estate lending and real estate bubbles, on excessive leverage especially related to implicit government guarantees, and on illiquidity phenomena. Fintech, by providing for faster settlements, more transparency and diversification, is likely to have as many stabilizing as destabilizing effects. If the large banks of today are not as large five or 10 years from now, I think it is more likely to be because of bad lending, heavy regulation or market pressures to break up because the whole is valued less than the sum of the parts than it will be because of disruption from fintech. I say this because much of what fintech does depends on the banking system and because I doubt that over this horizon banks can be completely disrupted. I argued that financial regulation should be directed at functions and at institutions not at particular financial instruments noting that most instruments could be synthesized in multiple ways and suggesting that all might have similar impacts. The video of our full conversation can be watched here. My overall conclusion was that fintech is likely to make a substantial contribution by removing frictions. Policymakers should be slow to accede to demands from incumbents for heavy regulation of new fintech entrants. At the same time, they should assure that when fintech companies succeed, it is on the basis of genuine efficiencies and not because of regulatory avoidance. President Trump’s tax proposals were rolled out yesterday by Treasury Secretary Mnuchin and NEC Director Cohn. For reasons of long run budget health, fairness, and economic impact I think they are extraordinarily ill-advised. I am certain that the substantive concerns I have will be extensively addressed in the debates to come. As I read about the proposals and thought back over the tax discussions of the last year, I found myself feeling sympathetic to Secretary Mnuchin. Some of the most difficult moments for any cabinet officer comes when the President fails to respect his Department’s desire to do serious policy work, when political circumstance forces the repudiation of his major past statements, and when he has to out of loyalty support absurd propositions. All three of these things happened to Secretary Mnuchin this week. By all accounts the Treasury was on a path working with other agencies to come forth by June with a set of tax reform proposals. Treasury officials were shocked when the President, speaking in the Treasury building, announced last Friday that the Administration would unveil its tax plan today. There was no time for specification of a proposal, let alone consultation on its merits, estimates of its revenue impact, or evaluations of its economic impact. Instead the Treasury Secretary was asked to lend his prestige and that of his Department to a one page document that would have been judged skimpy on detail if it were a campaign proposal. I can only imagine how demoralized the Treasury tax staff-a group that rightly prides itself on its professionalism and analytic seriousness – must be. Mnuchin has stated on multiple occasions that the Administration’s tax proposals would not favor the rich. Whatever its other virtues, distributional neutrality is not a feature of the plan announced yesterday. Indeed, between massive corporate rate cutting, big tax cuts for the highest income individual taxpayers, elimination of the estate tax, and other incentives it is a certainty that the vast majority of the benefits of the plan will go to a very small fraction of tax payers. Secretary Mnuchin also stated last week, in what appeared to be a scripted interview, that tax cuts would be so good for growth that they would come very close to paying for themselves. This of course is the famous Laffer curve idea. In the context of an economy with 4.5 percent unemployment, it is absurd. Ronald Reagan asserted that tax cuts could pay for themselves during his campaign but his Treasury Department was far too serious to ever make such a statement. His Administration recognized that large tax cuts would raise deficits unless offset by spending cuts. So did the George W. Bush Administration. So have House and Senate Republicans. So has every reputable economist who has addressed the subject in the last several decades. The Treasury Secretary’s credibility is an important national asset that could be needed at any moment. I am very sorry to see it squandered on behalf of a set of tax reform proposals that are at best a bargaining position. As I learned (sometimes painfully) during my time at the Treasury Department, words spoken by Treasury secretaries can over time have enormous consequences, and therefore should be carefully considered. In this regard, I am very surprised by two comments made by Secretary Steven Mnuchin in his first public interview last week. In reference to a question about artificial intelligence displacing American workers, Mnuchin responded that “I think that is so far in the future — in terms of artificial intelligence taking over American jobs — I think we’re, like, so far away from that [50 to 100 years], that it is not even on my radar screen.” He also remarked that he did not understand tech company valuations in a way that implied that he regarded them as excessive. I suppose there is a certain internal logic. If you think AI is not going to have any meaningful economic effects for a half a century, then I guess you should think that tech companies are overvalued. But neither statement is defensible. Mnuchin’s comment about the lack of impact of technology on jobs is to economics approximately what global climate change denial is to atmospheric science or what creationism is to biology. Yes, you can debate whether technological change is in net good. I certainly believe it is. And you can debate what the job creation effects will be relative to the job destruction effects. I think this is much less clear, given the downward trends in adult employment, especially for men over the past generation. But I do not understand how anyone could reach the conclusion that all the action with technology is half a century away. Artificial intelligence is behind autonomous vehicles that will affect millions of jobs driving and dealing with cars within the next 15 years, even on conservative projections. Artificial intelligence is transforming everything from retailing to banking to the provision of medical care. Almost every economist who has studied the question believes that technology has had a greater impact on the wage structure and on employment than international trade and certainly a far greater impact than whatever increment to trade is the result of much debated trade agreements. As for the secretary’s questioning of tech company valuations, no one can predict markets, so he may turn out to be right. But with Apple trading at below the market average price earnings ratio, and Google trading with a price earnings ratio in the 20s at a time of very low volatility and near-zero long-term real interest rates, I do not understand the basis for Mnuchin drawing a conclusion about the inappropriate valuation of technology stocks. In a highly uncertain world with a major tax reform debate upcoming, the credibility of the Treasury secretary is an important national asset. I hope Mnuchin will soon find an opportunity to clarify his thinking on technology and to back off from judging appropriate sector valuations in the stock market. In narrow commercial terms right now, Mexican goods enter the United States on a preferred basis relative to Asian goods. This preference would disappear with NAFTA suspension. Furthermore about 70 percent of Mexican exports are of goods that are not finished but are inputs to further U.S. production. Anything that hurts Mexico therefore hurts us in global economic competition with China. There is a further, even more important, strategic dimension. As illustrated by the more than $60 billion China has poured into Hugo Chávez’s Venezuela, China would regard opportunities to ally with a hard-left anti-American government as strategic windfalls. What better than a country of 130 million people with a 2,000 mile border with the United States? Every Mexican with whom I spoke said that the risk of Mexico electing a Chávezlike government had gone way up in recent months on account of American disrespect and truculence. China apart, NAFTA strengthens the U.S. economy. U.S. tariffs without NAFTA would average less than 3 percent, so repeal would not greatly reduce protection. Indeed by undermining the peso, U.S. challenges to NAFTA have led to an effective 10 to 15 percent subsidy on all Mexican goods. There is the further point that the United States competes more effectively globally with access to low-cost Mexican inputs. More than two-thirds of our imports from Mexico are inputs to further U.S. processing. In my tribute to Kenneth Arrow, I asserted that he was unique among economists in having a theorem named after him. He may be unique in having an impossibility theorem named after him, and his may be the most profound theorem named after an economist, but my statement was wrong. Alas I was for the first time writing about economic theory without the benefit of Kenneth’s advice. He no doubt would have provided within 60 seconds a list twice as long as the one that follows. Among the theorems named after economists are: the Coase theorem, the Modigliani-Miller theorem, the Stolper-Samuelson theorem, the Gibbard–Satterthwaite theorem, and the Debreu-Scarf theorem. Kudos to any graduate student who can summarize the content of all 6 of them or remind me of others. McKinsey has a new study out on an important topic—the question of whether corporations systematically take too short a view and do not invest enough for the long term. If true — as many CEOs believe — this is a serious indictment of current corporate governance arrangements and has important policy implications. To take one close to my heart, if short termism causes under investment it will be a cause of secular stagnation. I am not sure what to believe in this area. On the one hand, there are many anecdotes suggesting that pressures to manage earnings hold back investment. And the short termism view is very widely believed. On the other hand, some of what is done in the name of long term may be unmonitored waste. The observation that many “unicorn” companies with no profits, and sometimes no revenues or even fully developed products, get valued so highly makes me skeptical of the idea that the capital market is systematically myopic. It is also the case that the companies generating the highest immediate cash flows — which should be overvalued on the myopia theory — historically have had the highest stock market returns, implying undervaluation rather than overvaluation. I was therefore excited to see that McKinsey had a new empirical study out that provides evidence in favor of the view that corporations should take longer views. They have a reasonable methodology. They divide their sample between companies that take a long-term view and those that do not and then compare their performance. They find that companies that take a long-term view perform better on many metrics like employment growth and shareholder return. Their findings deserve much discussion, debate and attempts at replication. At this point though I would give a Scottish verdict of “not proven” to their case. They may be right but I do not think they have provided evidence that would convince anyone other than a prior believer. Consider an analogy. It is doubtless the case that golfers with long swings like Phil Mickelson hit the ball further and more accurately than golfers with short swings like myself. An index of swing length would be highly correlated with almost any measure of golf performance. Does this mean I should lengthen my swing? I doubt it. Those with more flexibility and coordination are able to take and control longer swings and play golf better. If I were to try to swing like Phil, I would mishit the ball and maybe break my back. Some companies have great ideas, great management teams, and compelling strategies. They invest heavily, seek to grow revenue, ignore the management of earnings, and do limited stock buybacks. These are the criteria McKinsey uses to measure long termism. Others lack vision and have mediocre management. They invest less, cut costs more, manage earnings and buy back stock. McKinsey deems them short term focused. No surprise the long-term companies outperform the short-term companies. But this may be due to their vision and execution capacity not their long-term focus. Mediocre companies seeking to imitate them will be like me trying to imitate Phil—painful failures. I do not see any basis in the McKinsey results for saying that companies should extend their horizons. McKinsey tries to address this issue by doing comparisons within industries. But everything we know suggests that there are substantial differences in company quality within industries as well as across industries. Again, it may be that the long-termism hypothesis is right and there may be ways of teasing causality out of the very interesting data set that McKinsey has created. But at this point I think the issue is still unresolved. Ideas should be judged by their quality not their pedigree. I am not usually a fan of Republican tax policy proposals or environmental initiatives. But I strongly support the proposal put forward yesterday by Republicans George Shultz, James Baker, Martin Feldstein, Hank Paulson, Greg Mankiw and others for a substantial carbon tax in the USA to address global climate change. Their proposal that the carbon tax be coupled with a mechanism for rebates to consumers, a rollback of command and control regulation, and a border adjustment mechanism is also sound. The United States has a moral and a prudential obligation to lead on global climate change. There would be no clearer sign of our commitment than the introduction of a substantial carbon tax. Our adoption of a carbon tax would encourage others to follow. The border adjustment mechanism would be a further inducement since foreign countries would presumably prefer their carbon emitters pay them than pay us. And because a carbon tax is easy to change it would enable us to be responsive to new developments in the science of global climate change. Some of my friends may not completely agree, but I think the replacement of command and control regulation with a carbon tax is a positive step. It will reduce uncertainty and thereby encourage investment. Raising carbon prices has the virtue of discouraging all types of carbon use, be it from power production or transportation, from changing fuels or reducing energy use. It is therefore likely an efficient way to reduce emissions. Of course the devil is in the details and, as the authors point out, the tax has to be set high enough to reduce emissions at least as much as any repealed regulations. I also think that the proposal for a lump sum rebate that gives an equal amount to all citizens is a very sound one. Since a person with a $2 million income gets no more than a person with a $20,000 income, it is highly progressive. It reminds me of Alaska’s approach of sharing oil revenues equally with all citizens. I think that the approach of not adjusting the income tax but instead declaring a social dividend also will operate to give people a stake in environmental protection because whenever the carbon tax is raised, people will get a larger and highly visible rebate. It is hard to know how the Trump administration, which has flirted with climate denialism and has been less than embracing of traditional Republicans, will react to today’s proposal. I do know that they could change the way they are perceived in many parts of the world and by many well-intentioned Americans if they tried to run with it. It is also hard to know how Democrats will react. I hope they will seize on prominent Republican endorsement to take the largest steps on global climate change in our history and at the same time to achieve the most universal social benefit. Many business people think it is wonderful that we now have an Administration filled with people from business backgrounds. To a point, I relate. People who have worked primarily in the private sector bring an awareness that others sometimes lack of maintaining business confidence, which as I have often said is the cheapest form of stimulus. And for some government tasks, management experience is much more important than policy experience. That is why Bob Rubin and I worked to install a (Republican) business leader as commissioner of the IRS given its vast IT problems. Unfortunately, just as being able in government does not equip you to step in and run a company—at least not without much help—so also business experience does not equip you to run on your own public policy and political processes. The concerns of those who worry about business dominated government have been demonstrated all too clearly by the Trump administration’s roll-out of plans to scale back financial regulation. There are surely areas where regulation is too burdensome, particularly involving bureaucratization and small banks. But much of what was said by the President and his advisors sounds more like grousing at an East Hampton cocktail party than a serious basis for public policy reform. The President suggested that it was a problem that many of his good friends could not get as much credit as they wanted. We do not travel in the same social circles, so I am not sure who he means. But if he is saying that real estate developers cannot get all the credit they want, that would seem a good thing. Indeed, I would submit that the financial history of the last 40 years demonstrates that often when real estate operators are thrilled about credit availability, financial crisis is only a few years away. Gary Cohn, the former number two at Goldman Sachs now heading the NEC, asserts that “ we are not going to burden the banks with literally hundreds of billions of dollars of regulatory costs every year”. I would challenge him to document that such costs exist today, which feels to me like an “alternative fact”. Note that total bank profits last year were about 170 billion so the claim is that without excessive regulation profits would more than double. There is room for reasonable argument about the fiduciary rule requiring that financial advisors act in the best interest of their clients. I think the case made in the Obama CEA report is very strong but I can see counter arguments. Cohn’s analogy that “this is like putting only healthy food on the menu, because unhealthy food tastes good but you still shouldn’t eat it because you might die younger” is bizarre. We do after all require food labeling, inspect food processing, and no one is suggesting that financial products be banned, only that the economic interests of advisors be disclosed. It does not get better. Leaving aside Cohn’s statement that “we have all submitted living wills” referring to Goldman Sachs, which was a slip for a policy official, I wonder why an Administration that professes to hate “too-big-to-fail” wants to scale living wills for banks and plans for resolution way back. And Cohn’s argument that since banks are so well capitalized now we do not have to worry much about other aspects needs to reckon with the experience of 2008. Some of the institutions that failed, like Bear Stearns and Lehman Brothers, had capital cushions well above what both the Federal Reserve and Basel required to be labeled as “well-capitalized” in the week before their failures. Others like Goldman would likely have failed but for the bailout of their counterparties. 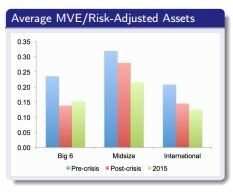 Evidence on ratios of the market value of equity to assets suggests that even after the recent run-up, banks are operating with historically high levels of operating leverage. I would rather live with even a very bad knee than let a carpenter operate on me. On the evidence of statements so far by those in the executive branch, the safest posture is to resist changes in the financial regulatory framework until there is proof that they have been thought through carefully. If and when this happens, there will be room to promote the flow of credit, reduce bureaucratic burdens, and make the financial system safer. This week the Trump rally continued as the Dow crossed 20,000 and our President issued a celebratory tweet. How much does this mean? To what extent is it a vindication of the economic policy approaches pursued by the new Administration? Will the post election rally continue? No one knows these answer and market timing is a fool’s game but I remain persuaded that markets and the economy are most likely enjoying a sugar high that will not last a year. First Dow 20,000 is a meaningless benchmark and crossing it means little. Its numerology not analysis to focus on round numbers. The Dow is an odd and arbitrary index which weights companies by their share price not their market value. It is highly limited in who is included with Goldman Sachs accounting for over 20 percent of the gain in the 30 stock index since election day. Second, as Bob Rubin constantly reminded his colleagues in the Clinton administration “markets go up, markets go down” and it is a mistake to judge policy on immediate market reactions rather than concentrating on fundamentals. The observation that the best post-election pre-inauguration performance of the stock market in the last 100 years occurred during Herbert Hoover’s transition underscores this point as does the market’s poor performance during the Roosevelt and Obama transitions. Third, there are indicators in markets of possible trouble ahead. While financial stocks have been very strong over the last several months, insider sales have soared. Despite what most observers see as highly uncertain environment, market expectations of near term volatility are near record lows suggesting scope for sudden disillusionment. Rapid inflows into mutual funds could easily go into reverse. Fourth, the fundamental basis for a big market rally is very unclear. If “pro business policies” were key over time it would not be the case that Democrat administrations have consistently seen stronger markets than Republican ones over the last 70 years. Recall also that nearly half of S&P 500 revenue is earned abroad and will not be enhanced by new US domestic policies but may be hurt by new nationalist measures. It is far from clear that corporate tax reform on the scale envisioned by the new administration will pass this year and even the hallmark 1986 Act had only modest stock market impacts. The impact of regulatory changes will be felt only in some sectors and may be offset by new populist measures such as restrictions on pharmaceutical pricing. Fifth, and most important new governments with authoritarian tendencies have historically brought about bull markets even before they led to disaster. Governments with much stronger authoritarian tendencies than anything plausible in the USA like those of Hitler or Mussolini nonetheless saw strong markets in their early years. I am not sure which is more difficult: predicting what President Trump will do next or timing the market. Either way after the events of the last week it is much easier to imagine downside than upside scenarios. I wonder what the business leaders who have been waxing enthusiastic about our new pro-business Administration are thinking right now. Confidence and prosperity depend on a perception of government credibility and confidence. Is that present when an administration lies about readily observable facts like crowd sizes and then defends the lie with the Orwellian concept of alternative facts? Does the business community really want NAFTA to be abrogated, Asian trade architecture turned over to the Chinese or a trade war launched with China? Secretary of commerce Designate Wilbur Ross vows to self-initiate dumping cases rather than waiting for industry to file. During the two administrations I served in industry discouraged such efforts because of retaliation fears. Have matters really changed or is the new Secretary ahead of his constituency? Do the financial cheerleaders for a business-leader dominated Administration approve of the emerging combination of weak dollar rhetoric from both the President and Treasury Secretary nominee along with strong dollar policy. If as Secretary designate Mnuchin has just written to Congress and the President has asserted the administration believes the dollar is too strong why are all its policies calculated to raise the dollar: (i) very expansionary fiscal policy (ii) complaints about easy money (iii) measures like the border tax adjustment that discourage imports and encourage exports (iv) measures to reduce capital outflows as American companies outsource? This is the least coherent dollar policy since the Carter Administration. I guess as someone put it to me in Davos business people are more comfortable with fellow business people than with policy people. Perhaps in forming views they should get modern and look at data. Almost 30 years ago in 1988 Roger Altman and I had a piece in the WSJ showing that in the then preceding 35 years the economy and corporate profits did much better with Democrats in power. At the time I thought the point was a valid counter to Republican rhetoric but not necessarily a strong regularity. But the best test of any statistical finding is looking at data subsequent to its publication. The recent much more thorough study by Alan Blinder and Mark Watson shows that Democrats are much better for business than Republicans. Little is going right or giving confidence. Increasingly I think the sugar high may be short lived. For the sake of their shareholders corporate leaders need to stop cheerleading and start insisting that policy have a modicum of logical coherence and factual support. Edmund Burke famously cautioned that “the only thing necessary for the triumph of evil is for good men to do nothing.” I have been reminded of Burke’s words as I have observed the behavior of US business leaders in Davos over the last few days. They know better but in their public rhetoric they have embraced and enabled our new President and his policies. I understand and sympathize with the pressures they feel. I used to remind my colleagues in the Obama White House that “confidence is the cheapest form of stimulus.” There is a clear case for corporate tax reform, for some targeted regulatory relief and a more positive government attitude towards business. Businesses who get on the wrong side of the new President have lost billions of dollars of value in sixty seconds because of a tweet. And you cannot hope to have influence on an Administration you go out of the way to condemn. Yet I am disturbed by (i) the spectacle of financiers who three months ago were telling anyone who would listen that they would never do business with a Trump company rushing to praise the new Administration (ii) the unwillingness of business leaders who rightly take pride in their corporate efforts to promote women and minorities to say anything about Presidentially sanctioned intolerance (iii) the failure of the leaders of global companies to say a critical word about US efforts to encourage the breakup of European unity and more generally to step away from underwriting an open global system (iv) the reluctance of business leaders who have a huge stake in the current global order to criticize provocative rhetoric with regard to China, Mexico or the Middle East (v) the willingness of too many to praise Trump nominees who advocate blatant protection merely because they have a business background. I have my differences with the new Administration’s economic policies and suspect the recent market rally and run of economic statistics is a sugar high. Reasonable people who I respect differ and time will tell. My objection is not to disagreements over economic policy. It is to enabling if not encouraging immoral and reckless policies in other spheres that ultimately bear on our prosperity. Burke was right. It is a lesson of human experience whether the issue is playground bullying, Enron or Europe in the 1930s that the worst outcomes occur when good people find reasons to accommodate themselves to what they know is wrong. That is what I think happened much too often in Davos this week. On Monday, I gave a speech at Brookings and then had a discussion with my Harvard colleague Ed Glaeser on aspects of infrastructure investment. Here are the links to the video and transcript. While for reasons described below I believe the Trump campaign proposals are wholly ill-conceived, I remain convinced that an increased and improved programme of public infrastructure investment would be very much in the American national interest. The case for public investment today rests largely on grounds of long-run policy and microeconomic efficiency given the sub-5 per cent unemployment rate. My remarks and conversation with Ed focused on five main issues. First, improved infrastructure has benefits that go well beyond what is picked up in standard rate of return on investment calculations. Because infrastructure is integrative, we often fail fully to understand the benefits of investment. Nonquantitative historians are convinced that the Transcontinental railway played a crucial role in American history. They believe it permitted the integration of the west and more broadly drew our nation together. This idea was famously challenged by Nobel Prize economist Robert Fogel in his doctoral dissertation. Fogel pointed out that transport made up only a small per cent of GDP and that the railroad was only a certain per cent cheaper than canals so the contribution to economic growth had to be small. I suspect this calculation, which mirrors those usually done in evaluating infrastructure projects such as high-speed rail, misses the benefits of integrative infrastructure in spurring investment and promoting agglomeration by increasing the range over which the best companies can expand and compete. My bet is that the railway project was in fact very important for the US economy. I suspect something similar can be said on a global basis about the Suez or Panama Canal projects. There is a broader point as well. Investments in a location can be divided between those that have “spill-out consequences” and those that have “pull-in” effects. Investments in new science, for example, have benefits that spread out widely, as do investments in educating children some of whom inevitably migrate. Investments in infrastructure on the other hand have benefits that are local to where they take place and are likely to attract other investments. For example, Dulles airport and its successive expansion has been a huge spur to the economic development of Northern Virginia. At a time of resurgent interest in the national dimension of economic success, infrastructure projects have the virtue that their benefits are very much concentrated where the investments take place. Second, there is a particularly compelling case for maintenance investment. Ed and I agreed that there was a presumption that this should be the case since all the incentives facing political decision makers work against adequate maintenance. Deferred maintenance liabilities are largely unmeasured, unnoticed and passed on to subsequent generations of elected officials. No one can name a maintenance project. The desire to come in on budget discourages what might be called “pre-maintenance”, such as when the high-return insulation investments got stripped out at the last moment of Harvard building projects. The examples are pretty stark. The American Society of Civil Engineers, which is admittedly an interested party, estimates that extra repairs for American automobiles each year have a cost that is the equivalent of a 75 cent a gallon gasoline tax. As I have said many times, look at La Guardia or Kennedy airport. I was struck many years ago by the young teacher who approached me in Oakland after, as secretary of the Treasury, I gave a speech about the importance of education. She said “Secretary Summers — that was a great speech. But the paint is chipping off the walls of this school, not off the walls at McDonald’s or the movie theatre. So why should the kids believe this society thinks their education is the most important thing?” I had no good answer. As with potentially collapsing bridges, prevention is cheaper than cure and in many cases the return on “un-derferring” maintenance far exceeds government borrowing rates. Borrowing to finance maintenance should not be viewed as incurring a new cost but as shifting from the fast-compounding liability of maintenance to the slowly compounding liability of explicit debt. It should also be noted that inevitably one maintains what has been used, so maintenance investment is much less likely to turn out a white elephant than new infrastructure investment. My guess is that the US could profitably spend an additional 0.5 per cent of GDP, or about $1.25tn over the next decade, on maintenance of its infrastructure. Third, there are important new infrastructure investment projects that almost certainly have high rates of return. I have previously used as an example the renewal of the US air traffic control system. While vacuum tubes are no longer in use in our system, radar technology of the kind used during the second world war is pervasive, and there is essentially no role for GPS in our current architecture. The result is greater than necessary threats to safety, substantial unnecessary emission of greenhouse gases as planes circle to maintain greater than necessary distances from each other, pervasive delays during peak travel times, and inefficient usage of airport capacity. Current plans do not involve a satisfactory system being fully implemented until the mid-2030s. The Treasury department recently released a study identifying 40 projects with a combined cost in the range of $200bn and cost-benefit ratios in the range of 2 to 10. This does not take account of technological progress. For example, autonomous vehicle technology will create new possibilities for very high speed travel lanes. And new developments in energy storage and transmission create potential for infrastructure technologies that will yield large social benefits by facilitating the adoption of renewable energy technologies like solar and wind, where intermittency is an important issue. I suspect also that pervasive fast wireless will create benefits that are currently unimaginable in the same way that the Transcontinental Railroad did. I would be very surprised if another 0.5 per cent of GDP could not be profitably invested in new infrastructure over the next decade. A $2.5tn programme would still leave public investment at levels that are low by the standards of the post-war period in the US or other countries. Given how much less we are now spending — of the order of 3 per cent of GDP — on national defence compared to the more than 5 per cent we spent for much of the post-war period, it is not plausible to assert that we cannot afford these investments as a nation. Indeed, if over time infrastructure investments yield a return of even 6 per cent and if government can capture even 1/6 of that return in increased tax collection, they will pay for themselves at current low levels of real interest rates. Fourth, better infrastructure investment is as important as more infrastructure investment. Quality is as important as quantity. Progressives are right to decry the inadequate level of public investment in the US. Conservative complaints about regulatory obstacles, problems in project selection, inefficient procurement and inattention to the use of pricing in assuring the efficient use of infrastructure are equally valid. The short 300-foot bridge outside my office connecting Cambridge and Boston has been under repair with substantial traffic delays for nearly five years. Julius Caesar built from scratch a bridge seven times as long spanning the Rhine in nine days! Famously, it has taken longer to repair the eastern span of the Bay Bridge in San Francisco than took to build the original. Yes, Robert Moses and his contemporaries were too heedless of the environment and the interests of local communities. But we can surely find ways of coming to far more rapid decisions with far less promiscuously distributed veto power than is the case in much of the country today. There is too much pork barrel and too little cost-benefit analysis in infrastructure decision-making. Projects should be required to pass cost-benefit tests and proposals like a national infrastructure bank that would insulate a larger portion of decision-making from politics should be seriously considered. Ed Glaeser is right that new infrastructure investment in declining areas is often a terrible idea as shrinking populations means that these areas have if anything too much infrastructure. And Field of Dreams — “build it and they will come” approaches do not have a very good track record. Ways should be found to make the costs of procrastination on maintenance more salient and to institutionalise resistance to low-ball cost estimates from advocates of more visionary projects. The goal of building rapidly at minimum cost should be the primary objective in infrastructure procurement. Deviations from this principle should take place only with compelling justification. Crucially, modern technology makes possible much more pricing of infrastructure usage than was once the case. In particular, transponder technology means that usage of roads can be priced with sensitivity to exact location and time much as power is priced today. To date, congestion pricing has been very difficult politically. My hope is that in the same way that pricing in the environmental area was once decried as “purchased licences to pollute” but is today quite widely accepted, formulas can be found to introduce congestion pricing. The benefits are potentially very large. And it should be possible to find formulas to compensate losers. To assert that current public investment decision-making is highly flawed should not be taken as a blanket endorsement of private sector reliance. While there are areas where public-private partnerships are desirable, these should be approached with great caution. The private sector often demands rates of return far greater than public sector borrowing costs, especially in the current low interest rate environment. Insisting on private participation could well substantially raise costs without addressing major problems. The proposals of Trump advisors Peter Navarro and Wilbur Ross to rely on tax credits to augment infrastructure investment are a textbook case of the dangers of knee-jerk private sector reliance. These benefits would (i) largely go to developers and contractors for infrastructure projects like new pipelines that would happen even without new incentives and so be highly regressive; (ii) raise costs by failing to reach the tax-free pension funds, sovereign wealth funds and international investors that are the most plausible sources of incremental infrastructure finance; (iii) not encourage at all the highest return maintenance projects like fixing potholes that do not yield a pecuniary return for investors; and (iv) by offering credits at an unprecedented 82 per cent rate, invite all kinds of tax-shelter abuse. Fifth, while the case for expanded infrastructure investment does not depend on Keynesian stimulus or aggregate demand considerations, secular stagnation risks reinforce the argument for increased public investment. As the previous points illustrate, there is a compelling case (wholly apart from any ideas about aggregate demand) for increased infrastructure investment. To the extent that, as I have argued elsewhere, the industrial world is likely to be prone to a chronic excess of saving over private investment in the years ahead, this case is reinforced. Excess saving means that very low real interest costs are likely to persist, reducing the capital cost of infrastructure investment. While the evidence is far from conclusive, my guess is that low real borrowing costs raise the risk of bubbles and financial instability. This argues for a shift in the policy mix, from monetary policy towards fiscal policy. And to the extent that, because of constraints on how low interest rates can go, recessions become more frequent and protracted in the years ahead, the case for expansionary fiscal policy is reinforced. To be clear, I do not believe that infrastructure investment can be turned on and off in response to cyclical fluctuations without big efficiency losses. And I do not believe there is a case for make-work projects that cannot be justified on microeconomic grounds. There is, however, a case for expanded public investment on a sustained basis with financing from borrowing or taxes that varies with cyclical conditions. There is also the consideration that infrastructure investment is likely to disproportionately benefit groups such as middle-aged men with limited education who face a major structural employment problem. One way of thinking about this is that it means the real cost of investment is lower because those working on infrastructure would otherwise have been jobless and perhaps collecting unemployment or disability benefits. Another is to simply note that even if the economy does not face a chronic shortage of demand overall, it does face a shortage of demand for certain types of labour and policies that address this shortfall are, other things being equal, desirable. While President-elect Trump’s plans for infrastructure stimulus are, I think, misguided and probablyharmful, I agree with the incoming administration on one thing: the case for a substantially increased programme of public infrastructure is undeniable. On Monday, I gave a speech at Brookings and then had a discussion with my Harvard colleague Ed Glaeser on aspects of infrastructure investment. Here are the links to the video and transcript. While for reasons described below I believe the Trump campaign proposals are wholly ill conceived, I remain convinced that an increased and improved program of public infrastructure investment would be very much in the American national interest. The case for public investment today rests largely on grounds of long run policy and microeconomic efficiency given the sub-5 percent unemployment rate. First, improved infrastructure has benefits that go well beyond what is picked up in standard rate of return on investment calculations. Because infrastructure is integrative, we often fail to fully understand the benefits of investment. Nonquantitative historians are convinced that the Transcontinental railroad played a crucial role in American history. They believe it permitted the integration of the West and more broadly drew our nation together. This idea was famously challenged by Nobel Prize economist Robert Fogel in his doctoral dissertation. Fogel pointed out that transport was only a small percent of GDP and that the railroad was only a certain percent cheaper than canals so the contribution to economic growth had to be small. I suspect this calculation, which mirrors the ones usually done in evaluating infrastructure projects like high-speed rail, misses the benefits of integrative infrastructure in spurring investment and promoting agglomeration by increasing the range over which the best firms can expand and compete. My bet is that the railroad project in fact was very important for the American economy. I suspect something similar can be said on a global basis about the Suez or Panama Canal projects. There is a broader point as well. Investments in a location can be divided between those that have “spill-out consequences” and those that have “pull-in” effects. Investments in new science for example has benefits that spread out widely, as do investments in educating children some of whom inevitably migrate. Investments in infrastructure on the other hand have benefits that are local to where the investment takes place and are likely to attract other investments. For example Dulles airport and its successive expansions has been a huge spur to the economic development of Northern Virginia. At a time of resurgent interest in the national dimension of economic success, infrastructure projects have the virtue that their benefits are very much concentrated where the investments take place. Second, there is a particularly compelling case for maintenance investment. Ed and I agreed that there was a presumption that this should be the case since all of the incentives facing political decision makers work against adequate maintenance. Deferred maintenance liabilities are largely unmeasured, unnoticed and passed on to subsequent generations of elected officials. No one can name a maintenance project. The desire to come in on budget discourages what might be called “pre-maintenance,” such as when the high return insulation investments got stripped out at the last moment of Harvard building projects. The examples are pretty stark. The American Society of Civil Engineers, who are admittedly an interested party, estimate that extra repairs costs for American automobiles each year have a cost that is the equivalent of a 75 cent a gallon gasoline tax. As I have said many times, look at La Guardia or Kennedy airport. I was struck many years ago by the young teacher who approached me in Oakland after as Secretary of the Treasury I gave a speech about the importance of education. She said “Secretary Summers—that was a great speech. But the paint is chipping off the walls of this school, not off the walls at McDonald’s or the movie theatre. So why should the kids believe this society thinks their education is the most important thing” I had no good answer. As with potentially collapsing bridges, prevention is cheaper than cure and in many cases the return on “un-derferring” maintenance far exceeds government borrowing rates. Borrowing to finance maintenance should not be viewed as incurring a new cost but as shifting from the fast compounding liability of maintenance to the slowly compounding liability of explicit debt. It should also be noted that inevitably one maintains what has been used, so maintenance investment is much less likely to turn out a white elephant than new infrastructure investment. My guess is that the United States could profitably spend an additional 0.5 percent of GDP or about $1.25 trillion over the next decade on maintenance of its infrastructure. Third, there are important new infrastructure investment projects that almost certainly have high rates of return. I have previously used as an example the renewal of the US air traffic control system. While vacuum tubes are no longer in use in our system, radar technology of the kind used during World War II is pervasive, and there is essentially no role for GPS in our current architecture. The result is greater than necessary threats to safety, substantial unnecessary emission of greenhouse gases as planes circle to maintain greater than necessary distances between themselves, pervasive delays during peak travel times, and inefficient usage of airport capacity. Current plans do not involve a satisfactory system being fully implemented until the mid 2030s. The Treasury Department recently released a study identifying 40 projects with a combined cost in the range of $200 billion and cost-benefit ratios in the range of 2 to 10. This does not take account for projects that take account of new technological progress. For example, autonomous vehicle technology will create new possibilities for very high speed travel lanes. And new developments in energy storage and transmission create potential for infrastructure technologies that will yield large social benefits by facilitating the adoption of renewable energy technologies like solar and wind, where intermittency is an important issue. I suspect also that pervasive fast wireless will create benefits that are currently unimaginable in the same way that the Transcontinental Railroad did. I would be very surprised if another 0.5 percent of GDP could not be profitably invested in new infrastructure over the next decade. A $2.5 trillion program would still leave public investment at levels that are low by the standards of the post-World War II period in the United States or other countries. Given how much less we are now spending–on the order of 3 percent of GDP — on national defense compared to the above 5 percent we spent for much of the post-War period, it is not plausible to assert that we cannot afford these investments as a nation. Indeed, if over time infrastructure investments yield a return of even 6 percent and if government can capture even 1/6 of that return in increased tax collections, they will pay for themselves at current low levels of real interest rates. Fourth, better infrastructure investment is as important as more infrastructure investment. Quality is as important as Quantity. Progressives are right to decry the inadequate level of public investment in the United States. Conservative complaints about regulatory obstacles, problems in project selection, inefficient procurement, and inattention to the use of pricing in assuring the efficient use of infrastructure are equally valid. The short 300 foot bridge outside my office connecting Cambridge and Boston has been under repair with substantial traffic delays for nearly 5 years. Julius Caesar built from scratch a bridge 7x as long spanning the Rhine in 9 days! Famously, it has taken longer to repair the eastern span of the Bay Bridge in San Francisco than took to build the original. Yes, Robert Moses and his contemporaries were too heedless of the environment and the interests of local communities. But we can surely find ways of coming to far more rapid decisions with far less promiscuously distributed veto power than is the case in much of the United States today. There is too much pork barrel and too little cost-benefit analysis in infrastructure decision making. Projects should be required to pass cost-benefit tests and proposals like a national infrastructure bank that would insulate a larger portion of decision-making from politics should be seriously considered. Ed Glaeser is right that new infrastructure investment in declining areas is often a terrible idea as declining population means that these areas have if anything too much infrastructure. And Field of Dreams— “build it and they will come” approaches do not have a very good track record. Ways should be found to make the costs of procrastination on maintenance more salient and to institutionalize resistance to low-ball cost estimates from advocates of more visionary projects. Crucially, modern technology makes possible much more pricing of infrastructure usage than was once the case. In particular, transponder technology means that usage of roads can be priced with sensitivity to exact location and time much as power is priced today. To date, congestion pricing has been very difficult politically. My hope is that in the same way that pricing in the environmental area was once decried as “purchased licenses to pollute” and is today quite widely accepted, formulas can be found to introduce congestion pricing. The benefits are potentially very large. And it should be possible to find formulas that assure that losers are compensated. The proposals of Trump advisors Peter Navarro and Wilbur Ross to rely on tax credits to augment infrastructure investment are a textbook case of the dangers of knee-jerk private sector reliance. These benefits would (i) largely go to developers and contractors for infrastructure projects like new pipelines that would happen even without new incentives and so be highly regressive; (ii) raise costs by failing to reach the tax-free pension funds, sovereign wealth funds and international investors who are the most plausible sources of incremental infrastructure finance; (iii) not encourage at all the highest return maintenance projects like fixing potholes that do not yield a pecuniary return for investors; and (iv) by offering credits at an unprecedented 82 percent rate, invite all kinds of tax shelter abuse. Fifth, while the case for expanded infrastructure investment does not depend on Keynesian stimulus or aggregate demand considerations, secular stagnation risks reinforce the argument for increased public investment. As the previous points illustrate, there is a compelling case (wholly apart from any ideas about aggregate demand) for increased infrastructure investment. To the extent that, as I have argued elsewhere, the industrial world is likely to be prone to a chronic excess of saving over private investment in the years ahead, this case is reinforced. Excess saving means that very low real interest costs are likely to persist, reducing the capital cost of infrastructure investment. While the evidence is far from conclusive, my guess is that low real borrowing costs raise the risk of bubbles and financial instability. This argues for a shift in the policy mix, from monetary policy towards fiscal policy. And to the extent that, because of constraints on how low interest rates can go, recessions are more frequent and protracted in the years ahead, the case for expansionary fiscal policy is reinforced. To be clear, I do not believe that infrastructure investment can be turned on and off in response to cyclical fluctuations without big efficiency losses. And I do not believe that there is a case for make-work projects that cannot be justified on microeconomic grounds. There is however a case for expanded public investment on a sustained basis with financing from borrowing or taxes that varies with cyclical conditions. There is also the consideration that infrastructure investment is likely to disproportionately benefit groups like middle-aged men with limited education who face a major structural employment problem. One way of thinking about this is that it means the real cost of investment is lower because those working on infrastructure would otherwise have been unemployed and perhaps collecting unemployment or disability benefits. Another is to simply note that even if the economy does not face a chronic shortage of demand overall, it does face a shortage of demand for certain types of labor and policies that address this shortfall are other things equal desirable. While President-Elect Trump’s plans for infrastructure stimulus are I think misguided and likely harmful, I agree with the incoming Administration on one thing: the case for a substantially increased program of public infrastructure is undeniable. There are many aspects of the economic policy of the new Administration that I find misguided. But I am most troubled by what the President-elect did with Carrier to hold on to an extra 700 jobs in Indiana. Ronald Reagan’s response to the air traffic controllers’ strike was a small act that had profound consequences. I fear in a similar way that the negotiation with Carrier is a small thing that is actually a very big thing—a change very much for the worse with regards to the operating assumptions of American capitalism. Market economies can operate anywhere along a continuum between two poles. I have always thought of American capitalism as dominantly rule and law based. Courts enforce contracts and property rights in ways that are largely independent of just who it is who is before them. Taxes are calculable on the basis of an arithmetic algorithm. Companies and governments buy from the cheapest bidder. Regulation follows previously promulgated rules. In the economic arena, the state’s monopoly on the use of force is used to enforce contract and property rights and to enforce previously promulgated laws. Even though we know of instances of corruption, abuse of power, favoritism and selective enforcement, we take this rules-based system for granted. But looking around the world today or back through American history, this model is hardly a norm. Many market economies operate what might be called ad hoc or deals-based capitalism: Economic actors assume that they have to protect their property and do their own contract enforcement. Tax collectors use discretion in assessing taxes. Companies and governments buy from their friends rather than seek low cost bids. Regulators abuse their power. The state’s monopoly on the use of force is used to enrich and satisfy the desires of those who control the apparatus of the state. This is the world of New York City under Tammany Hall, of Suharto’s Indonesia, and of Putin’s Russia. Reliance on rules and law has enormous advantages. It greatly increases predictability and reduces uncertainty. It reduces expenditures on both guarding property and seeking to appropriate property. It promotes freedom because most of the people most of the time do not take political positions with a view to gaining commercial advantage. The advantages of the rule of law are so great that I would claim that there is no country more than 2/3 as rich as the United States that does not have a strong tradition of the rule of law based capitalism. And I know of no country where the people are free where the rule of law does not largely govern market interactions. What about Carrier? The President-elect of the United States decided in a purely ad hoc basis that he wanted Carrier to remain in Indiana. He deployed some combination of carrots and sticks at his disposal to lever Carrier into doing what he wanted. Implicitly or explicitly, there must have been sticks, as press accounts suggest that the tax benefits provided offset only a small part of the savings foregone by staying in Indiana. It is not hard to see from the point of view of United Technologies, the parent of Carrier, that for a company with more than $50 billion in revenue its surely worthy $60 million dollars to not be on the wrong side of a possibly vindictive President of the United States. It seems to me what we have just witnessed is an act of ad hoc deal capitalism and worse yet its celebration as a model. As with the air traffic controllers only a negligible sliver of the economy is involved but there is huge symbolic value. A principle is being established: it is good for the President to try to figure out what people want and lean on companies to give it to them. Predictability and procedure are less important than getting the right result at the right time. Like Hong Kong as the mainland increasingly imposes its will, we may have taken a first step towards a kind of reverse transition from rule of law capitalism to ad hoc deal-based capitalism. The commentary on the President-elect’s actions has emphasized its novelty, has emphasized the difficulties of scaling, and in the case of Bernie Sanders has argued that the actions taken were insufficiently forceful because some workers will still be relocated to Mexico. All of this misses the point. Presidents have enormous latent power and it is the custom of restraint in its use that is one of the important differences between us and banana republics. If its ad hoc use is licensed, the possibilities are endless. Most companies will prefer the good to the bad will of the US President and his leadership team. Should that reality be levered to get them to locate where the President wants, to make contributions to the President’s re-election campaign , to hire people the President wants to see hired, to do the kinds of research the President wants carried out, or to lend money to those that the President wants to see assisted? Some of the worst abuses of power are not those that leaders inflict on their people. They are the acts that the people demand from their leaders. I fear in a way that is more fundamental than a bad tax policy or tariff we have started down the road of changing the operating assumptions of our capitalism. I hope I am wrong but I expect that as a consequence we are going to be not only poorer but less free. Yesterday, I gave a keynote speech at the World Innovation Summit for Health on “The Future of Aid for Health”. When I agreed to give the speech, which built on the work of a Commission I chaired several years ago on Global Health 2035, I did not imagine the degree of uncertainty that the US election would bring to the global health area and indeed to the global community. My argument was simple. The world needs to move decisively away from the current regime where 80 percent of health assistance is devoted to supporting national health care delivery and only 20 percent is devoted to global service delivery towards a model where half of assistance is devoted to global goods. In part this is because of the problematic aspects of continuing foreign assistance to national governments for health which raises issues of fungibility, sustainability and of distortion of countries’ exchange rates. Mostly though it is because of the overwhelming return on investments in global goods that bear on health. –investments in the development of the polio vaccine had returns orders of magnitude greater than investments in more iron lungs. —Dean Jamison, Victoria Fan and I demonstrated that the expected costs of global pandemics like the Spanish flu after World War I are in the same general range of those associated with climate change even though they receive almost no policy attention. –research on tobacco and its health impacts, if fully acted on, could avert 200 million tobacco related deaths over this century. And the set of issues around sugar and obesity are today in a place similar to where tobacco issues were 50 years ago. –Many believe that the anti-microbial resistance—the development of bacteria that are resistant to antibiotics is the largest health risk facing humanity in coming decades and that much too little is being done to address it. I am reasonably confident about my judgement regarding health assistance priorities though aspects of my argument are certainly open to debate. I am certain though that foreign assistance priorities should be based on analysis, evidence and argument. The more morally important the issue, the more important is rigorous analysis and debate. As I read the obituaries and saw reactions to Fidel Castro’s death I was struck by two things. First, history will judge the US embargo policy a total failure. Suppose it’s authors had been told nearly 60 years ago that The Berlin Wall will fall. The Iron Curtain will fall. The USSR will break into 15 separate nations. Central Europe will join NATO. Russia and China will renounce Marxist Leninism. McDonald’s will come en masse to Moscow and Beijing. US Presidents will routinely summit with China which will become one of our largest trading partners. And a Castro will still rule Cuba for another quarter century. There is a huge lesson here in the dangers of isolating a nation rather than engaging with it. Yitzhak Rabin was right when he noted that “you don’t make peace with your friends”. We could have done much better. Second, President-elect Trump’s response has been highly problematic. I share his loathing of Castro, his record, his ideology and all he stood for. And I was disturbed by the statements like those of Canadian PM Justin Trudeau that seemed to celebrate Castro as a heroic leader. But it’s instructive to contrast the President-elect’s celebration of Castro’s death, condemnation of Cuba’s governance, and bragging about his campaign with America’s response at other epochal moments. After Stalin died at the height of the Cold War, President Eisenhower’s reached out to the Russian people emphasizing our common humanity under God. Or one can consider President George H.W. Bush’s carefully modest and non-gloating response to the fall of the Berlin Wall. The goal of Presidential statements should be to advance US interests not to settle scores or score points. I hope the that President-elect Trump will adopt a different tone once in office.